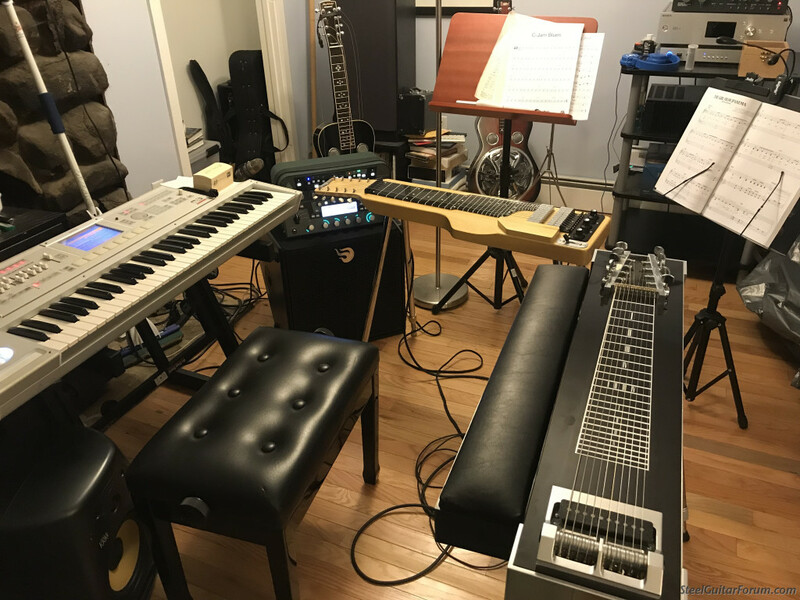 Pedal steel as non pedal. First impressions of the Cougar. Topic: Pedal steel as non pedal. First impressions of the Cougar. So I took possession of a 10 string non-pedal Cougar steel guitar on Friday. Here are my first impressions. Herb Steiner has always suggested using an old Maverick, taking the pedals off, and using it as a non pedal. That is sort of what I have with Cougar. 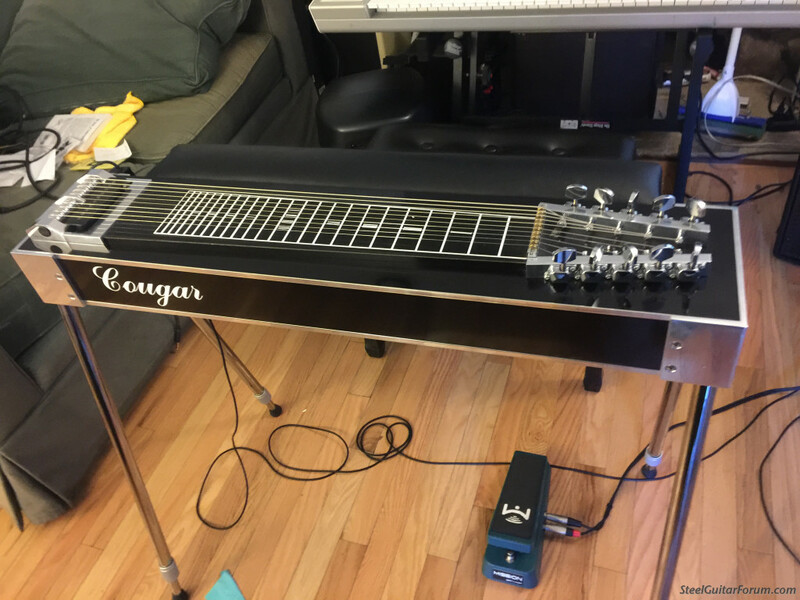 For all intents and purposes, the Cougar is a pedal steel guitar without the pedals. Originally I bought it to put the eharp tuning on. First thing I noticed: it is freaking hard to change the strings. Instead of a notch to put the ball end of the string, it is like a pedal steel which means I'm hooking the string's ball end to a small thin shaft on these finger like mechanism that would normally allow the strings to be raised and lowered on a pedal, but have no function at all on a non-pedal. It literally took me a half hour to get the first string tuned up on it. i finally got the hang of it, but it was a learning curve. Second is the sound: it does not sound like any non-pedal steel I have ever heard. It sounds like a pedal steel, and has an INSANE amount of sustain. You hit a note and you can leave the room and it will still be ringing. Just an amazing. The other problem is the eharp tuning didn't sound right. I think the chromatic strings didn't work with all the overtones this thing shoots off. It just sounded muddy. So, I took the strings off and put Tom Morrells E13 tuning on it with the low E on the bottom. WOW!!!! It just took off and the sound is so incredibly rich and full and deep it is literally blowing my mind. So my set up is now Eharp tuning on the Eharp, E13 on the Cougar. The Cougar was an incredible bargain. $500. Heavy as a mother, but just an incredible non pedal steel. I think you're experiencing the difference between vintage tone and modern tone. The Eharp (and other vintage steels) have single coil pickups with fewer windings than modern pickups. The sound produced it thinner, and some would say sweeter than modern guitars. Not the big, fat, "bassy" tones found in modern steel guitars, especially PSGs. Then there's the construction of the instrument, body size, metal roller bridge, metal nut, the scale length, etc. And the string spacing is closer on the Cougar, which makes it feel quite different. The Eharps have fairly wide string spacing compared to other steel guitars. Yes, I've come to learn the about the windings. I personally wouldn't call the sounder "thiner" but definitely sweeter, mellower, almost acoustic like (certainly more piano like). The construction as well, with the eharp being a slab of wood, and the cougar being more of box. The cougar is 24", the eharp 23. Actually as far as string spacing, they are not too different, but it will take some muscle memory. If anything, the Cougar makes me appreciate the eharp even more. Going back and forth is nice contrast. Hi , Bill- on the string changing I suggest trying an old pedlar’s trick- cut a small wedge of foam or leather to just fit snugly in the bridge behind the string pin. 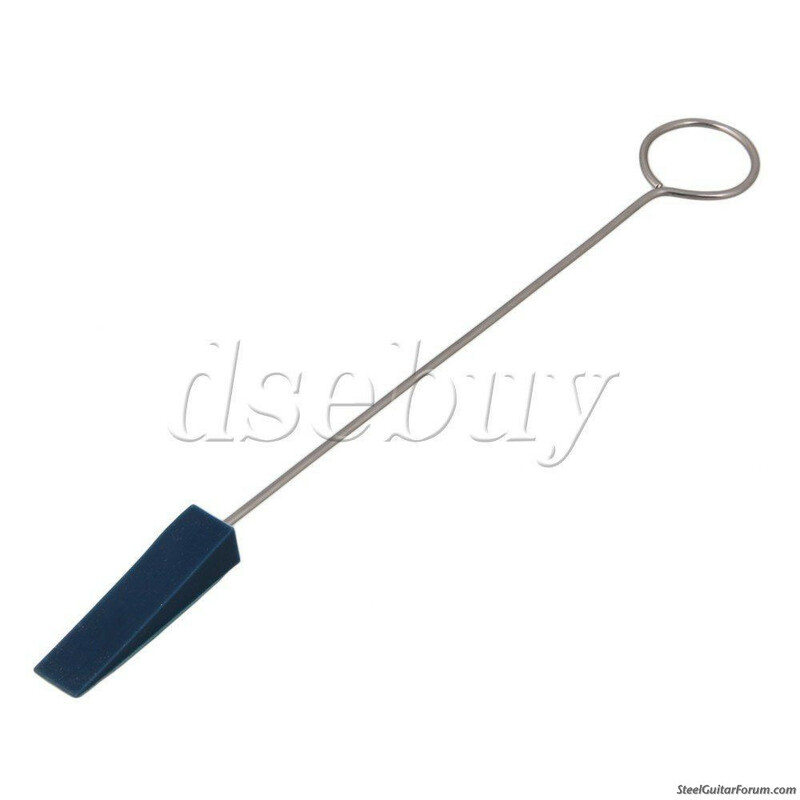 Slip the ball end over the pin, ( you might try slightly bending a curve into the string end to match the bridge radius), slip the wedge down behind the pin to hold the string on, then you can lay the string down along the fretboard to the nut. I leave about 2-2 1/2 inches of string ( the length between the tuner you’re attaching to and 1 1/2 tuners distance further along), and cut the rest off. Stick the string through the tuner hole about 1/4 inch and wind on the post, crossing over itself once to lock it down. Before tuning all the way up to pitch, pull out the wedge and make sure the ball end is seated all the way against the bridge finger (or it could snap off the pin when fully tightened). Sounds complex but you’ll get it down to a very short time. I had Freeman build me a ten string lap steel shortly before he passed, sounded and felt just like a pedal guitar. You can also use a make up wedge or a foam paint brush.